Day 3 of Event #56, $5,000 Six-handed No-Limit Hold’em, started with 16 players looking to make the final table and win the final preliminary event of the WSOP. Rory Mathews started the day as chip leader with 1,358,000 in chips, followed closely by Peter Feldman at 1,328,000 and Matt Hawrilenko with 1,327,000. It would be Hawrilenko who surged late to take the lead, the bracelet, and just over $1 million in prize money. Frank Calo was the first player knocked out of Day 3. After losing most of his chips after having his pocket queens cracked, Calo moved all in from under the gun for his last 149,000. He was called by Sean Keeton, who held K-Q. Calo held and needed help. The flop fell 5-9-K to give Keeton top pair and Calo a gutshot draw. The turn and river failed to fill Calo’s straight and he headed out in 16th place. Eugene Katchalov was next to hit the rail after a blind-vs.-blind confrontation with James St. Hilaire. Katchalov completed from the small blind and Hilaire raised to 60,000. Katchalov moved all in and Hilaire called. Katchalov started the hand ahead with against the of Hilairie. The lead was short lived as the flop fell . The turn gave Katchalov outs to a chop, but the river sealed the win for Hilaire, with Katchalov ousted in 15th place. In a couple of hands, Peter Feldman went from second in chips to the rail. First, Aurelin Guiglini doubled up through Feldman when Feldman raced against Guiglini’s pocket tens. Feldman had 625,000 after the hand but then fell victim to a set-over-set confrontation with Thorsten Schaefer. On a flop of , Feldman check-raised to 295,000 and Schaefer moved all in. Feldman call and showed his flopped set of fours, but Schaefer held pocket fives for a set of fives. Feldman was unable to catch the case four and hit the rail in 14th place. Aurelien Guiglini was eliminated in 13th place after getting his queens cracked. Faraz Jaka raised to 190,000 pre-flop and Guiglini moved all in for his last 500,000. Jaka called with and Guiglini opened his pocket queens. Jaka took the lead when the flop fell . The on the turn gave Guiglini additional outs as he picked up a flush draw. The river fell the and Guiglini took his leave. Next, John Conkright went all in and dominated against Josh Brikis; Conkright moved in pre-flop with and was called by Brikis, who held . The flop of put Brikis further in the lead, but Conkright picked up a Broadway draw. The board, though, bricked out and Conkright finished in 12th place. Rory Mathews started as the chip leader, but finished the day in 11th place. Mathews moved all-in pre-flop and Jonas Wexler reshoved all-in from the small blind. Mathews held and Wexler was firmly in the lead with . Wexler had to sweat a bit as the flop fell to give Mathews a flush draw. The turn and river failed to complete Mathews’ flush draw and he departed the tournament. Soon after, Alex Venovski moved-all in pre-flop with and ran into pocket aces from then-chip leader Faraz Jaka. The aces held to eliminate Venovski in 10th place and move Jaka up to 2.5 million in chips. James St. Hilaire finished in ninth after his pocket fours were outdrawn by Jonas Wexler. St. Hilaire was all in pre-flop with his fours against the of Wexler. The flop and turn failed to help either player, but the on the river ended St. Hilaire’s run. Next, Thorsten Schaefer fell in eighth place to Faraz Jaka. At the river, the board read . Jaka made a near-pot-sized bet and Schaefer moved all in. Jaka snap-called and turned over for the nut flush. Schaefer tabled for a mere pair of queens and hit the rail. Robert Kay was the final-table bubble boy of the event. Matt Hawrilenko raised to 105,000 pre-flop from under the gun. Faraz Jaka called before Kay moved all in for 1,333,000 more. Kay’s raise was the exact size of Hawrilenko’s stack and Hawrilenko made the call. Jaka folded to watch Kay table and Hawrilenko . Kay was unable to catch a queen on the board and hit the rail in seventh place, good for $100,230. The final table was set with Josh Brikis starting the final table as chip leader. Mattew Waxman was the first player eliminated from the final table. Sean Keeton raised to 150,000 from early position and Waxman moved all in for 605,000 from the cutoff. Josh Brikis then moved all in from the big blind and Keeton got out of the way. Waxman held and Brikis pocket kings. The board failed to produce an ace and Waxman headed to the payout window to receive his $138,394 prize for sixth place. Jonas Wexler exited in fifth after losing back-to-back all-in confrontations. First, he called an all-in bet from Sean Keeton pre-flop, but found himself dominated when Keeton flipped over against his . Keeton rivered kings-up to double up and Wexler was left with 700,000. A couple of hands later, Faraz Jaka raised to 150,000 from the button and Wexler moved all in from the small blind for 700,000. Josh Brikis then moved all in himself and Jaka folded. Brikis held and Wexler . Wexler was unable to catch a king on the board and headed out in fifth place. Wexler took home $189,555 for his strong performance. Sean Keeton fell in fourth place at the hands of Matt Hawrilenko. Jaka raised to 200,000 pre-flop and Keeton moved all in for 2,100,000. Hawrilenko then re-raised all in and Jaka let his hand go. Keeton turned over and Hawrilenko pocket jacks. The jacks held for Hawrilenko and Keeton collected $269,983. The hand gave Hawrilenko the chip lead at 6,950,000. Hawrilenko extended his lead after eliminating Faraz Jaka in third place. A pre-flop raising war ensured between Hawrilenko and Jaka resulting in Jaka moving all in for his tournament life. Jaka held pocket queens and found himself racing the of Hawrilenko. Hawrilenko took the lead on the flop of , but Jaka picked up a Broadway draw. The turn and river to seal the win for Hawrilenko and send Jaka home in third place. Jaka took home $400,526 for a strong finish. Heads-up play began with Matt Hawrilenko holding a lead of 9,025,000 to the 4,975,000 of Josh Brikis, but the title was decided only four hands later. In the final hand, Brikis raised to 300,000 from the small blind and Hawrilenko re-raised to 1,000,000. Brikis then moved all in and was snap-called by Hawrilenko. Brikis held and Hawrilenko held pocket jacks. The flop and the turn left Brikis drawing to three outs. The river fell the to give Hawrilenko the victory. Josh Brikis finished in second place and took home a hefty sum of $619,609 for a well-played tournament. 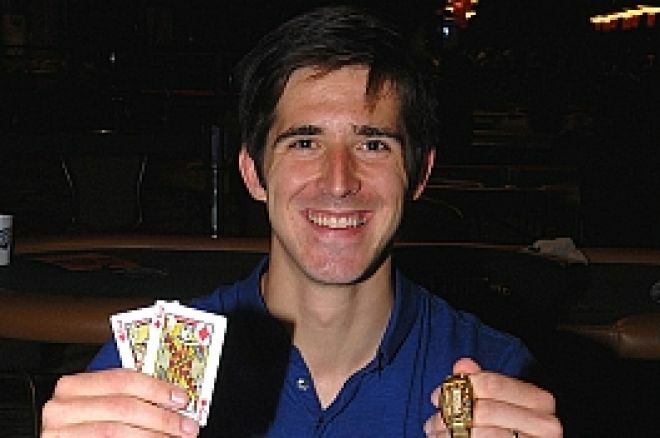 Matt "Hoss_TBF" Hawrilenko is known for his fixed-limit hold’em prowess, but broke through in NLHE in a big way here, with this victory the largest of his career in both cash and prestige. Hawrilenko took home his first bracelet and $1,003,163 in prize money.